Jhonen Vasquez was born to be a comic book artist—he started drawing as a child and hasn’t stopped since, though it wasn’t his primary career aspiration. He simply enjoys illustrating. His first published comic book, the darkly humorous Johnny the Homicidal Maniac, was based on a character he drew in high school that he later submitted to a publisher. In the years since Johnny debuted in 1995, Vasquez has drawn other comics like Squee!, I Feel Sick, and Fillerbunny, but he earned television fame by creating the cult favorite Invader Zim. The tale of an undercover operative of the imperialistic Irken Empire aired on Nickelodeon for almost two seasons, starting in 2001. While it may have gotten an early cancellation (with several unaired episodes), the show’s popularity hasn’t waned—17 years later, there are new Zim comics and collections published by Oni Press (including a fancy hardcover volume that’s already sold out) and a new Invader Zim TV special in production for Nickelodeon. When did you first start drawing and what inspired you? As a child, I just didn’t stop. I just kept with it. In pre-school, I was drawing dinosaurs—I was huge into dinosaurs. I wanted to be a paleontologist, not a cartoonist or a filmmaker or anything like that—just a paleontologist. So I would draw dinosaurs. And as the paleontology thing kind of waned—well, never completely waned; I’m still huge into dinosaurs and drawing monsters in general—I just kept with it until I got to combining storytelling. I still do now essentially what I did as a kid: I draw and tell stories. Now it’s just a little bigger and there’s an audience for it. It’s what I’ve always done; I don’t know why I started or how I started. When did it occur to you that drawing could actually be more than just for fun, but a livelihood? I still don’t think that it’s hit me, because it’s always been fun. It’s never gone from fun to work. I mean, I’ve gotten busy, I’ve gotten incredibly active with this stuff, and it’s gotten stressful. But I’ve always been under the assumption that people are going to wise up and I won’t have the option to make money off of it, so I just focus on making it enjoyable for me. It’s cool that people like what I do, but I don’t work for the audience. I have to be really into what I’m doing, as far as enjoying it goes. I’m aware of the fact that I’m able to make a living off of it and that I’m very lucky to be able to, because there are countless other people out there a thousand times more talented who just don’t get the recognition. Through chance or circumstance, I have done okay. I am able to just keep doing what I do, which is most artists’ dream. How did you get into the comics business with Johnny the Homicidal Maniac? I was drawing Johnny before I submitted him to Slave Labor, my publisher. I was basically drawing just for me, just for the hell of it, starting in high school. I used to do Johnny comics in the school paper, if you can imagine such a time. I mean, he was killing kids in the classroom and just going on rampages, blood everywhere—in the school paper. No one would do that now. The FBI would come haul you away; they haul off kids just for doing violent-looking drawings at their desks. Once you became a published comic book artist, what kinds of reactions did you get from readers? To this day, it’s still mostly positive. I don’t really get hate mail, which surprises me, but people have better things to do than to write hate mail to somebody who writes a book about hating everything, I guess. It’s odd. It’s very strange to go from being completely secluded and doing your own work for yourself, to having an audience—and having an audience that’s aware of what you do and expects you to do things that they like. It can make things difficult. 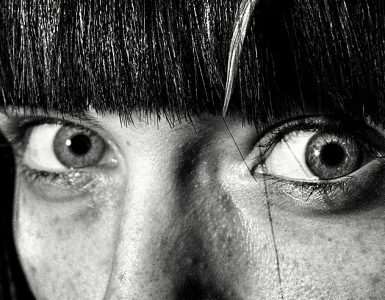 I don’t think it’s too healthy to focus on how you’re being perceived, but you can’t help but wonder, “Who are these people who are reading my stuff?” But that’s for someone else to look into—that’s not for me. I’d be afraid to find out who they are, exactly. Was it easy or difficult to translate your style for a younger audience with Invader Zim? As far as doing something geared toward kids, it wasn’t hard at all. I mean, a lot of what I do is still kind of based on what I did growing up. A lot of the stuff I’m into is exactly what I was into as a kid: video games, robots, monsters, just spooky stuff. So that wasn’t a big deal. It became a big deal later on, because I was making what I thought would be a cool show for me to watch as a kid—which didn’t always mesh with what some of the people who were producing the show thought would be a cool kids’ show. But I stuck with it. It’s difficult—you’re arguing a lot for what you want to do, but if I didn’t do that, I think it would’ve ended being a much more generic show. So I think the suffering was worth it for the show. For me, it was just stress. As long as the show was something I was proud of, it was something I would argue for. As far as stylistically and visually, that was a lot more difficult because you’ve got so many passes from your character designs to the storyboard artist to the overseas animator, and it comes back not necessarily looking like what you drew. It’s like watching the first season of The Simpsons—it looks nothing like modern-day Simpsons. And I look at that first season of Zim, and it looks like everything it shouldn’t have to me. So it was cool seeing it progress to a state where I was a lot happier with it. And then it got cancelled. But what are you gonna do? Through the mainstream exposure of Invader Zim, did you get offers for other mainstream projects? Oh yeah. As soon as Zim ended, I got offers to basically do the exact same thing at other networks: an animated series for kids. I went through a lot of meetings just saying “Thanks, but how about something else?” But they want what’s familiar. You almost have to trick people, practically. 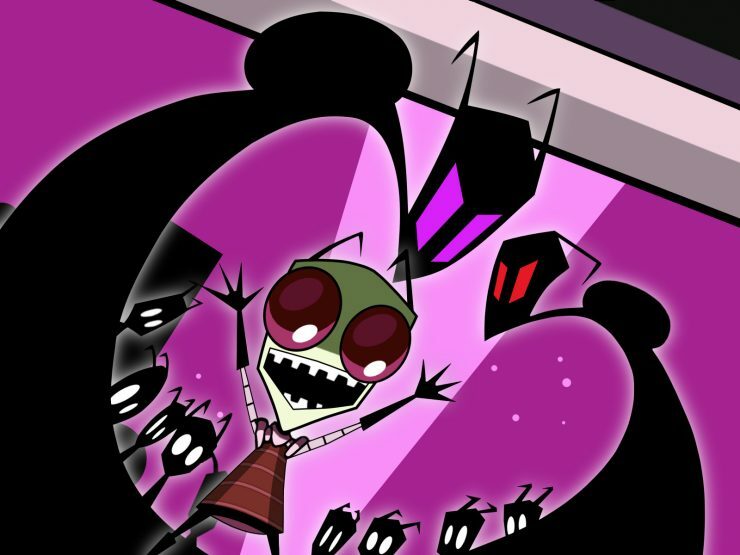 With Zim, they thought it was going to be a cute, little alien show. It’s not until you finally get the deal to go ahead and make your series that you turn it into something that’ll give kids nightmares—which is what I love. Then they’re like, “Oh God, these kids are having nightmares!” You’re lucky if you can get enough shows in that way. But to go to someone and say, “I want to make something that’s going to give kids nightmares”—not a great sell. I’ve had offers with other pretty big animation studios that are producing shows for television right now, and people who put stuff out for an older audience. But the thought of doing series television work is so unattractive to me right now. It’s not that I ever say outright “no,” but in terms of what people are looking for from me, it’s not necessarily what I want to do. I don’t want to do another kids show. To make a long story short, there have been offers, but I just usually say, “Thanks, but no thanks.” I’d rather be doing something that I’m a lot more interested in. Would you ever like to design a video game? I wouldn’t want to get stuck doing video games, but I’d love to do just one or two. I mean, I grew up on them—a huge part of my inspiration is video games. I’d love to have just taken part in one that I’m proud of having helped create. And it’d just be cool to control the characters, not just watch them—something that came from my head that other people can interact with. That’s another lifelong dream. One was comics; got that out of the way. One down. Animated series, pretty cool. But I’m still trying to get into the gaming thing. Do you plan out your projects, or do you just let ideas pop up? Oh, the ideas definitely just pop up—my head’s basically a constant storm of ideas that I’ve either worked on or are waiting to work on. But there’s this enormous back catalog from elementary school. A lot of the ideas that I still want to do are ideas I came up with as a little kid, and then there are those that just popped up a week ago or last night. But when it comes time to work on them, as far as the comics go, it’s a lot more stream-of-consciousness. It’s a free-form kind of thing. There’s a basic idea down there, where I want to start it and end it, but in between it’s a panel at a time as far as the dialogue and actual creation goes. That works for me a lot of the time, and other times it just damns my stuff because I end up at the end of a project going, “Oh my God, this is a mess. There’s no structure here. There’s just a mess of ideas.” But it works for some things; for something like Johnny, it was so scattered it really helped the feel of the book. For something like Zim, which was much more structured, that was something to get used to for me; that was suddenly dealing with revisions on scripts before we even get to animation. I like both ways; I don’t have a real preference right now as far as how I work. I’m always interested in trying a new approach for a specific project that may benefit from chaos or complete obsessive compulsive detail stuff.